Back in the heyday of Hulkamania, little did we know that when wrestling superstar Hulk Hogan urged us to “Train, say your prayers, take your vitamins, and believe in yourself” the “vitamins” the Hulkster was talking about were male enhancement supplements and prostate pills! 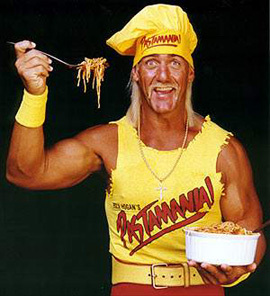 Hogan is now using his celebrity to pitch the Ageless Male testosterone booster. If you are so inclined you may search the Web for this piece of cinéma vérité. But what a stroke of luck for the manufacturers of these supplements! Do you doubt whether Super Beta Prostate and Ageless Male really work to promote testosterone and prostate health? Then just watch the video of Hulk Hogan in action for the proof! …after which the Hulkster will place his hand behind his right ear to hear the adulation of the cheering crowd. Do I want to see a TV infomercial with Hulk Hogan selling male enhancement and prostate pills? Ooooohhhhhh yeah! Hulk was offered, but turned down, the endorsement deal for the grill that ended up being a blockbuster hit with George Foreman. He’s pretty much been chasing that ghost ever since.